- Made of tun wood. - Bridge made of Bone. Our company is master in providing a wide array of superior quality Manual Tanpura. This Manual Tanpura is comfortable to handle and effective to use. Our Manual Tanpura is the important musical instrument that is generally used in recordings, live performance and many other purposes. Tanpura offered by us is manufactured using superior quality wood, which provides durability and resistance from termite attacks. The strings used in the Tanpura are of superior quality and does not break easily. This musical instrument has fine finish and natural polish. It is used in music schools, homes and also for stage performances.We are majorly looking for foreign queries. Matching up with the ever increasing requirements of the customers, our company is engaged in providing Gents Tanpura. Made from full size gourd and well-seasoned Tun wood for best sound and tone. Nicely Decorated with wood carving and celluloid inlay work. Fitted with fine craftsmanship bone bridge and carved pegs. Our company is a recognized name in this business that is known to offer our clients a wide assortment of Wooden Tanpura. Offered Wooden Tanpura is the preferred choice of professional and classical style musicians. We make these products using supreme quality wood and ultra modern machinery. We are a leading organization for providing Banjira Tanpura to our consumers. In addition, these are checked thoroughly before getting delivered at the destination of our patrons. The tambura, tanpura, tamburi is a long-necked plucked lute (a stringed instrument) found in different forms in Indian music culture. Hindustani musicians speak of 'tanpura' whereas Carnatic musicians say 'tambura'; 'tamburi' is a smaller instrument used for accompanying instrumental soloists. For practical use, all these types are called 'tanpura' in the text. 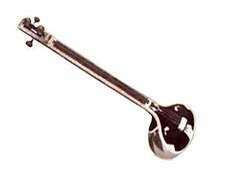 Tanpurais a long neck plucked string instrument, a resonator made of dried pumpkin attached at the bottom of Tanpura. This Tanpura is without Pumpkin resonator, it is wooden. We are one of the leading manufacturers of Tanpura, a musical instrument which had its origin in Southern India. It belongs to the family of lute. They come in different styles depending upon its size and the shape. 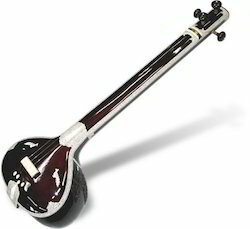 The Tanpura looks similar to a sitar. Our tanpura comes with a protective case and is available at affordable rates.